On the final day of InfoComm 2016, an on-site panel of AV professionals has selected LG Electronics Dual-View Flat OLED Display and Dual-View Curved Tiling OLED Display as winners of the InfoComm Best of Show Awards for digital signage. The award recognizes new and outstanding products exhibited at InfoComm 2016—the largest, most exciting event in the Western Hemisphere focused on the pro-AV industry, with more than 1,000 exhibitors, thousands of products, and 40,000 attendees from 110+ countries. We at LG were extremely energized by all the reactions and responses from visitors coming to our booth from around the globe. The buzz was amazing, just like the displays, and these outstanding awards confirm it. LG commercial OLED displays offer businesses a space-efficient solution for providing their customers with a two-sided media experience in Full HD (1920 x 1080) or 4K Ultra HD (3840 x 2160) resolution, with the ability to swap and mirror content on either side of the screen with a simple press of a remote control button. These best-of-show displays are pencil-thin and designed to be used in “off-the-wall” ways. 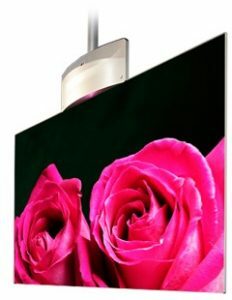 Our Dual-View Flat OLED display can be hung from the ceiling or stood on the floor. And our Dual-View Curved Tiling 4K OLED display can be used to form large floor-standing displays that link two, three or four tiles together. LG OLED displays enable completely immersive and highly engaging environments for customers, like never before possible. It’s an incredibly creative solution for showcasing content that’s as powerful and successful as the business itself. What’s more, the OLED commercial displays have the same unparalleled picture quality of LG’s award-winning consumer OLED TVs – hailed by industry experts as the pinnacle of display innovation. In fact, LG OLED represents an entirely new category of displays that deliver awe-inspiring images with perfect blacks and incredible color, even from wide viewing angles unlike any LCD/LED display can achieve. Perfect blacks? Yes. Because each of the screen’s pixels can be turned off, it creates an infinite contrast ratio and brings colors to life in unprecedented ways. The Dual-View Flat OLED displays will start shipping in July to fulfill the many orders we’ve already received at the show. LG commercial OLED displays are sure to inspire businesses to try some off-the-wall thinking themselves. And just like the buzz, the displays and the awards, the customer experiences are going to be amazing.